JNN 02 Oct 2014 Riyadh : Saudi Arabia has so far barred 98,000 would-be pilgrims from reaching Makkah after they failed to show the documents that would allow them to enter the sacred city in the western part of the kingdom during the Hajj season. No one, including Saudi nationals and expatriates living in Saudi Arabia, is allowed into the city to perform Hajj if they are not registered with accredited Hajj operators and do not have the permits required by the authorities. A tight cordon is established around the city to ensure there is no breakthrough. 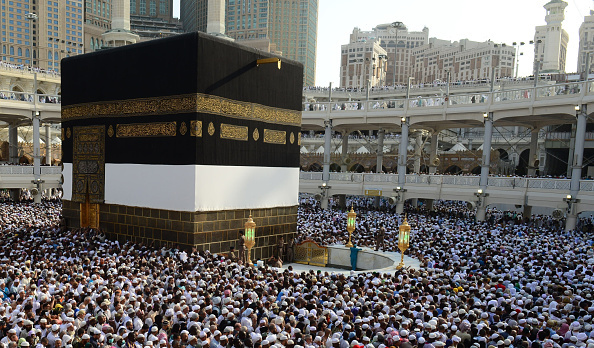 More than 1.4 million foreign pilgrims, about one-fourth of whom are from the Indian sub-continent, will perform Haj this year, Saudi Arabia’s Hajj Minister said on Tuesday ahead of the world’s largest annual gathering. Despite the cordon and the regular warnings, thousands of people without proper papers invariably attempt to push their luck and way into the city, often by taking rugged dirt roads and through hills. However, the security servicemen often catch them and bar them from entering. The decision to allow only those with valid documents is based on security and organizational concerns related to the large crowds expected to congregate in the area. Last year, a 300-kilometre security cordon was established around Makkah to keep away infiltrators. The cordon included 30 fixed checkpoints and 50 mobile patrols and a special support force of 200 members was on permanent standby for emergency cases. The Oil Rich Saudi Ruling family which is been in Power for decades , have never thought of Planning the Holy Cities in a way that the Maximum No. of Pilgrims can be accommodated on economical Packages . On the contrary they have even Bulldozed the Old Building in the vicinity of the Holy Cities owned by the Locals ,which were more economical for the average Pilgrims . Rather in the Name of Modrenization the Royal family Members have invested heavily in Building Luxurious 5 Star Hotels for the accommodation of the Wealthy Pilgrims , as these Luxurious Hotels are source of High Revenue earning for the Royal family Members , which are out of the reach of the Common Muslims ,the Majority of whom are Poor , and could not afford to Use them . On the other hand the Post Saddam Government of Iraq in Comparison to the Saudi Monarchy , which is a new Democracy , and is a war ravaged country , and is still fighting the Menace of terrorism and Invasions by the same Saudi Infested terrorists , May be in the name of Al Qaeda , Al Nusra or ISIL , But even after facing all the difficulties , and being less Wealthier than the Saudi Monarchy , also make arrangements for Muslim congregations Like Arbaeen in Karbala , the size of which is Multiple times Bigger than the Haj Congregation , Due to the fact that it is Much more economical for the Locals as well as the foreigner travelling to the Holy Land of Karbala , and at the same time there are no Bars by the Iraqi Govt., which is even have Much More Security Threats . But still committed to accommodate , Rich as well as the Poor Pilgrims , intend to Make the Holy Pilgrimage. Saudi Monarchy Bans Quran Copies accompanied by the Pilgrims. Saudi Ministry of Awqaf and Islamic Affairs has decided that Hajj pilgrims, while in Masjid Al-Haram, can only use Quran copies printed in Saudi Arabia. Saleh Al-Dismani, an official with the ministry, said pilgrims are not allowed to take copies of the Quran into the mosque, Dar al-Akhbar news website reported. He urged the pilgrims to read the copies of the Quran that are available in the mosque. Noting that King Fahd Complex for Printing the Holy Quran in Madinah distributes to pilgrims copies of the Holy Quran and translation of its meanings in various languages, Al-Dismani said Quran copies other than those printed by the complex will be confiscated during the Hajj season. He asserted that the decision was taken because of the possibility that Qurans printed elsewhere might be distorted or contain printing errors. More than two million Muslims from all over the world have descended on the holy city of Makkah for the annual Hajj. Hajj activities include turning around the Ka’aba, the most sacred Islamic site, seven times counterclockwise to show unity among believers worshipping Allah, the Arabic word for God. Hajj is the fifth and last pillar of Islam. All physically fit and financially able Muslim men and women are required to perform Hajj at least once in their lives.All able-bodied Muslims are religiously obliged to perform the Hajj pilgrimage once in their lifetime. The Sectarian Nature of Saudi Government is quite imminent from the above Mentioned Rule that Only the Saudi translation of the Holy Quran is allowed , which is there Pure Wahhabi version . Discrimination on the basis of Sects is a Pure Saudi Monarchy’s Culture & Practice in the Country, and which they are even trying to Propagate through the Wahhabi Terrorist Organizations , across the Globe , which is a Dangerous Trend for the Muslims World , as the Unity among Musllims is a vital Organ , which is being Disintegrated by Such Sectarian acts. This entry was posted in Jafria, Middle East and tagged hajj pilgrimage, Holy Cities, Holy Pilgrimage, Holy Quran, Mecca & Medina, Quran, Saudi Arabia, saudi monarchy. Bookmark the permalink.